Crispy edges, soft centers; extra-crispy French fries baked not fried – so you can feel good about eating them! When it comes to French fries, the single most important thing is the crispiness factor. We all know what typically makes the fries so crispy is the fact that they take a nice long, deep swim in a huge vat of oil. However, I am not a fan of that method. Why? Because…. 1. Our version, which uses the oven is super simple and these fries outshine all the others. They have the crispy outside and soft inside of their deep fried pals, without the oozing grease. And, since they aren’t deep fried, they don’t start to get soft and soggy as they cool off. They stay nice and crunchy, even when they are totally cooled. 2. Oven-baked fries are a bit healthier than deep-fried. 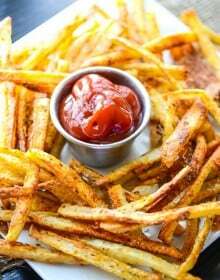 The secrets to these incredible fries include a few of things, the main one being soaking the raw potatoes before you bake them to remove some of the excess starch. Less starch = more crispiness. When it comes to slicing, I like to cut the fries to be a little thin; but not shoestring-style and not too thick. About 1/4 inch wide. To slice the potatoes, I slice the whole potato lengthwise and then slice each piece of the potato again into fries. Parchment paper is key in keeping the fries from sticking and getting the best crisp on the outside while keeping a soft inside. You could also use foil, but make sure you spray the foil with non-stick spray because you don’t want your fries to stick to the pan. Try not to crowd the fries on the pan and make sure they have a bit of space in between each other. The less fries on the pan, the better. 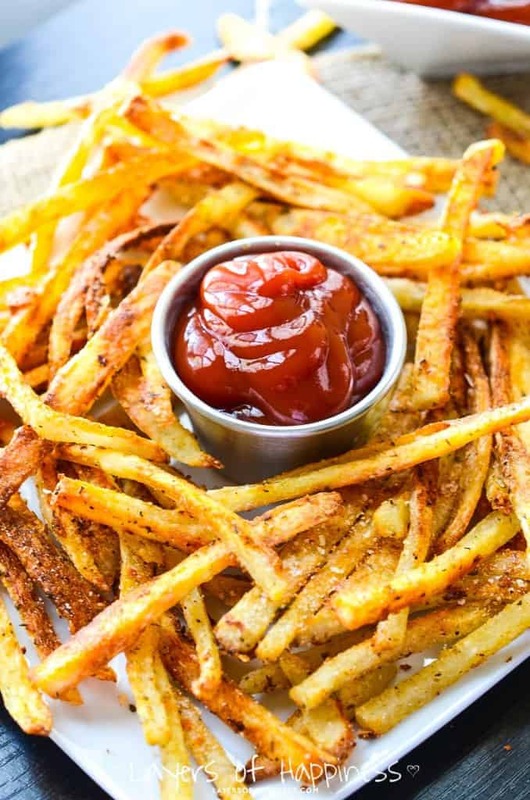 Too many fries shoved together and they’ll just steam – not bake. I can normally fit the fries from 3 potatoes on a 13×18-inch jelly roll pan. Finally, the last trick up my sleeve is my double baking method. The fries are first baked in the oven at 400 degrees for 30 minutes, then baked for another 20 minutes at 425 degrees. The second most important thing is the seasoning. Whether it be plain sea salt or our spice blend, you’ve gotta have seasoning! 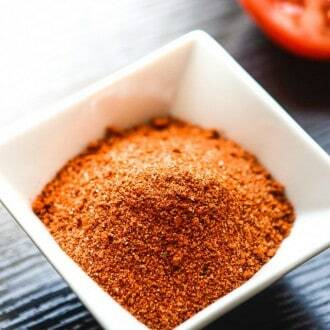 To date, our favorite seasoning is a mixture of seasoned salt, black pepper, dried basil, cumin, and chili powder. 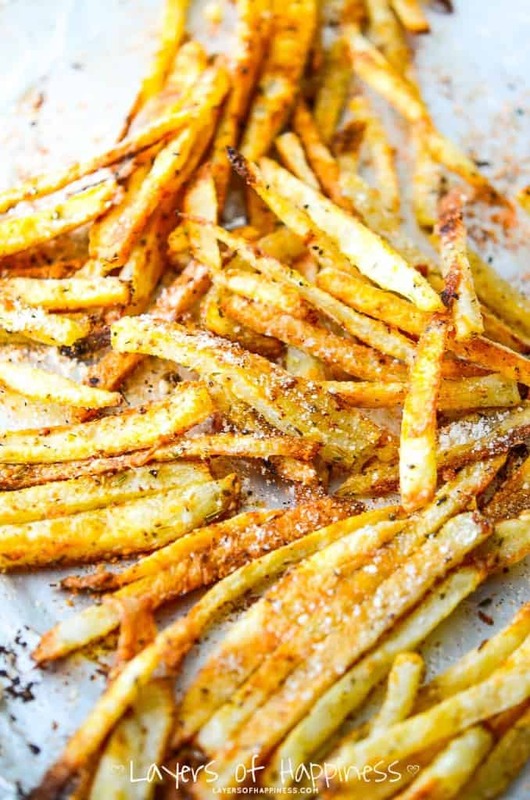 That seasoning mix makes these already addicting french fries even more irresistible! To make the seasoning, combine 2 Tablespoons seasoned salt, 1 teaspoon chili powder, 1 teaspoon dried basil, 1/8 teaspoon cumin, and 1/8 teaspoon black pepper per 3 potatoes. 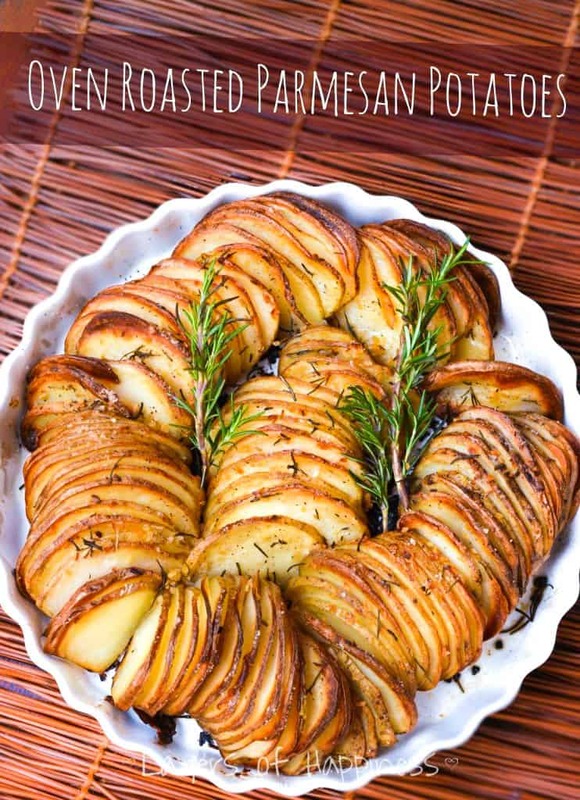 The seasoning goes on the potatoes both before and after baking. If you’re feeling fancy, you could also sprinkle some grated Parmesan on the fries after baking. The amount of potatoes you use depends on how many fries you want to make. If you’re baking for just yourself, I’d use 1 large potato. If you’re making the fries as a side dish for a family of 4+, I’d use 1 medium size potato per person depending how hungry you are. 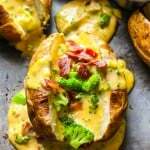 I love making these because potatoes are (1) cheap (2) readily available year-round (3) nutritious (4) don’t spoil quickly (5) easy (6) delicious. After the fries have soaked, drain, rinse, and lay the fries on a paper towel lined cooling rack to dry while you preheat the oven to 400 degrees. Blot the tops with additional paper towels to absorb any excess moisture. How lovely, and healthier too! Thanks for your tips, and for giving me some fries I can enjoy and include in my diet while I am in my peak season…without putting a ton of extra unhealthy fats in there. Yum! 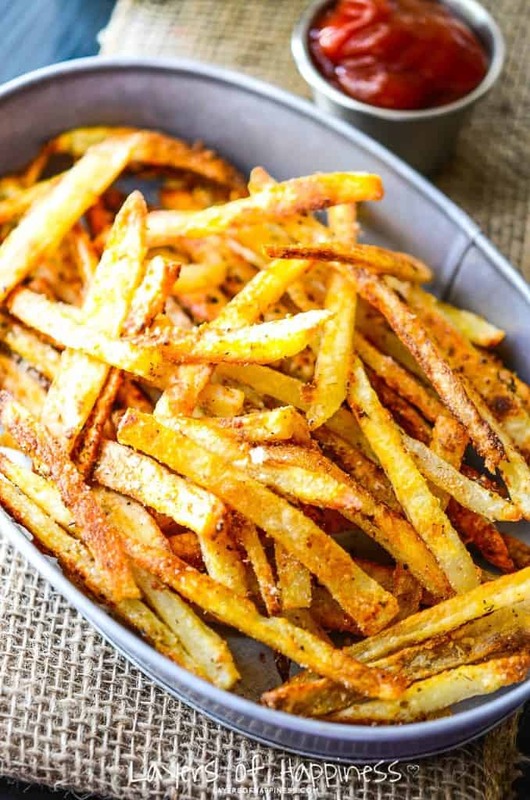 Do you have any advice for making these yummy looking fries in a convection oven? Thanks! Your picture looked so good, I had to use my giant farmer’s market potato and shoved all the fries together on the sheet. Next time I will have to be more careful and maybe split onto two sheets–you are right, you cannot compromise the space between fries or else they steam! Not terrible, I satisfied my pregnant craving for fries anyway. Glad I found your site through Pinterest! These look amazing! I was wondering if you knew the how many calories are there per serving? Jen and Emily, you are SO right about the texture of the fry… these look phenomenal, pinned! Your fries look awesome! My kids are going to love those! I like that these are baked and not fried. All of the oil from fried potatoes upsets my stomach. So I’ve got to try your recipe. 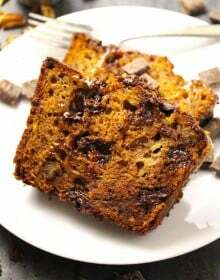 Love the idea of double-baking to get extra crispness. I have never tried that! 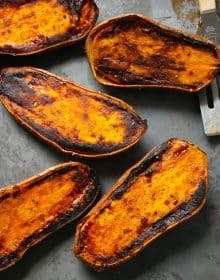 I will try it next time I make sweet potato fries in the oven (can’t do regular potatoes due to a nightshade intolerance). I like to use a silicone liner/silpat to line my baking sheets when making oven-fries – no sticking and it is reusable which I like a lot…. Yes! 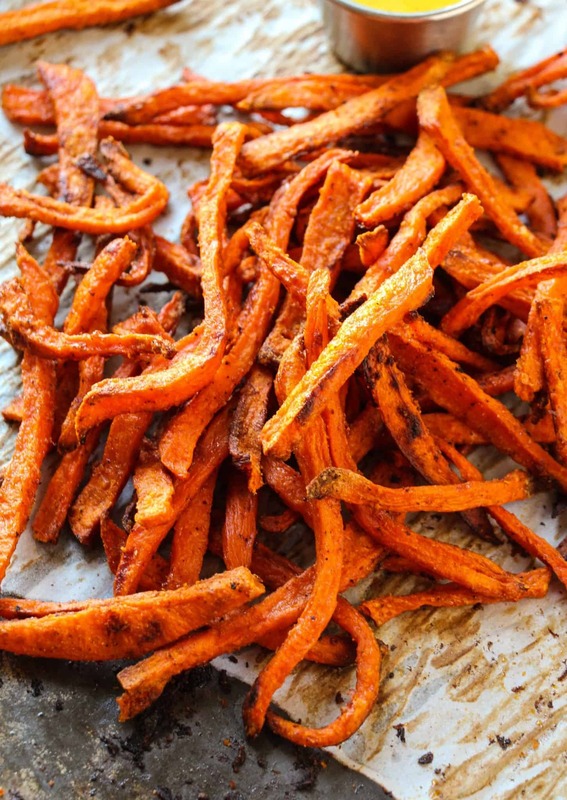 Let us know how the sweet potatoes turn out… that’s next on our list! 🙂 I’ve been wanting to get a Silpat for a while now, just haven’t gotten around to it yet! Double baking smart idea. I need to try your method. Not only do the photos look drool-worthy, I appreciate all the wonderful tips too. Your seasoning mix sounds awesome also. SO happy to have you sharing at our Weekend Potluck party. We’d love to have you link back to the party within your post…it makes you eligible to be featured. =) Do come again soon. These look AMAZING! 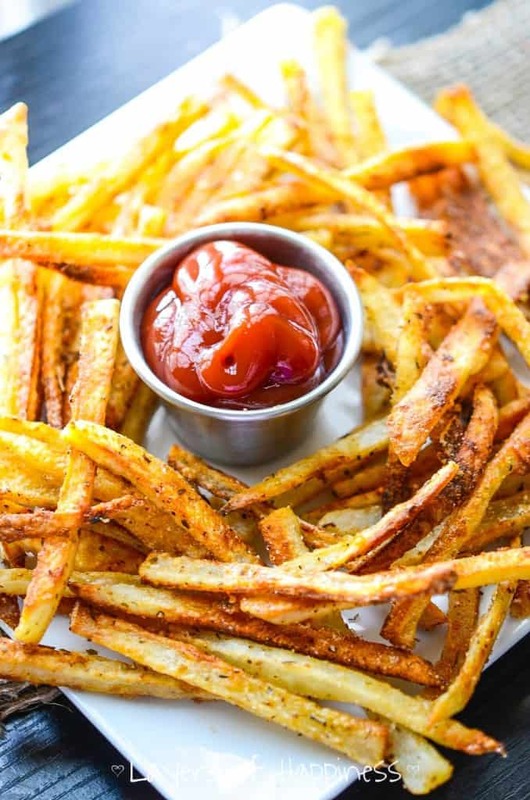 I love french fries, especially crispy ones, so I will have to make these soon. Thanks for the recipe! I made these for lunch today, and my kids devoured them! I used a slightly different spice mixture, but otherwise followed your recipe. Thank you so much. Good lord I think it’s supposed to be 2 teaspoons on the seasoning salt not tablespoons! I’ll try again next time!! Just a little question.. if you are making these for a crowd, can you do 2 jelly roll pans at the same time? I just made these with lunch today and they were by far the crispiest fries I have ever made! YUM! I will be using this method for my fry making in the future for sure. I’m curious to see how it works with sweet potato fries. Yay!! Thanks so much for leaving some love 🙂 We haven’t tries sweet potatoes yet – it’s on our list of things to make – but I would imagine everything would be the same! These look wonderful, I’ve recently had to make a huge change in my diet, which includes absolutely no fried foods. So I think I will definitely try these. Thanks Kathleen! Good for you for making the huge change! So inspirational! I don’t know how thick you cut your potatoes, but just 1 tablespoon of the spices was way too salty. I’m going to cut it back to 1 teaspoon for the next batch. These were awesome fries and easy to make. Bookmarked! I made these fries for dinner last night and they were fantastic! My boys loved them – said they were the best fries I had ever made. I’m not a huge fan of fries, but these guys could make me change my mind. I forgot to soak the cut potatoes to remove the starch and they were still delicious. Thanks for a great recipe. I just love french fries, but other than the frozen variety, I haven’t tried making them myself. This looks simple enough to do and healthier too without all those “how do you pronounce that” ingredients. These are the only fries I make now. I never use oil or frozen fries anymore. Yummy..these look great..just wondering is the oven temp fan fprced pr conventional? I’m not sure what fan forced is, but I didn’t use conventional, just the regular oven setting! I just made these, I only used salt and pepper though, but they were amazing! And they looked exactly like the picture! Will be making these probably weekly! I love fries, but hate how greasy they can be! This looks absolutely amazing! Can’t wait to try it! 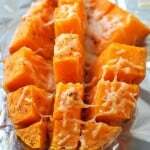 I made these tonight with regular and sweet potatoes. They were awesome! My kids and I loved them to bits! 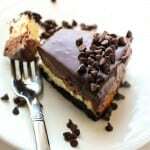 Thank you for posting this recipe. 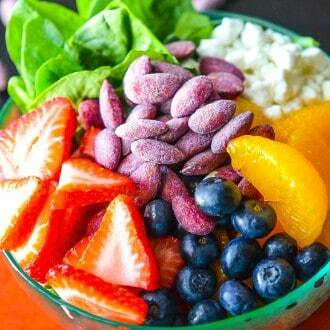 Thanks for the awesome feedback… love hearing our readers make our recipes! Jen and Emily, My husband and I are enjoying these ever so tasty treats right now! Thank you for the idea and the seasoning. Back to the table to enjoy baked fries!! I can’t wait to try these. I have tried a lot of baked French Fries and have had some good ones, but they always stick. I have never thought of using parchment paper. My family absolutely loved the fries!!!! I made them last night for dinner and my kids were begging me to make more for lunch! Thanks for such a great recipe!!!! Could I ask about the “seasoned salt” you use. I live in Japan and about the only seasoned salt I can get may be Crazy Salt. 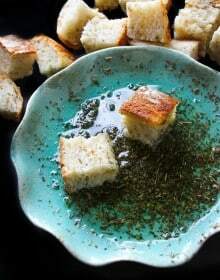 If I used just plain salt, how much should I use for this recipe? 1 tablespoons or even less. Even that much seems a lot to me. The amount of salt we can eat in a day seems to be getting reduced every year by the nutritionists! Such an amazing recipe! Followed it to a T and the fries turned out amazingly. I have made these numerous time since then, such a family favorite. Thank you for a healthier version of our favorite indulgence. A MUST try. Wow! I just came across this recipe today and cooked these babies tonight with bison burgers. Absolutely amazing! I shared this recipe on all my social networks, I was so impressed. I’ve never done that before! Thank you! So glad you liked them Brian! Bison Burger….YUM! Could I make these ahead and either refrigerate or even freeze them. Then bake them for a couple minutes to heat/crisp them back up? Great idea. I’m going to try it this weekend. 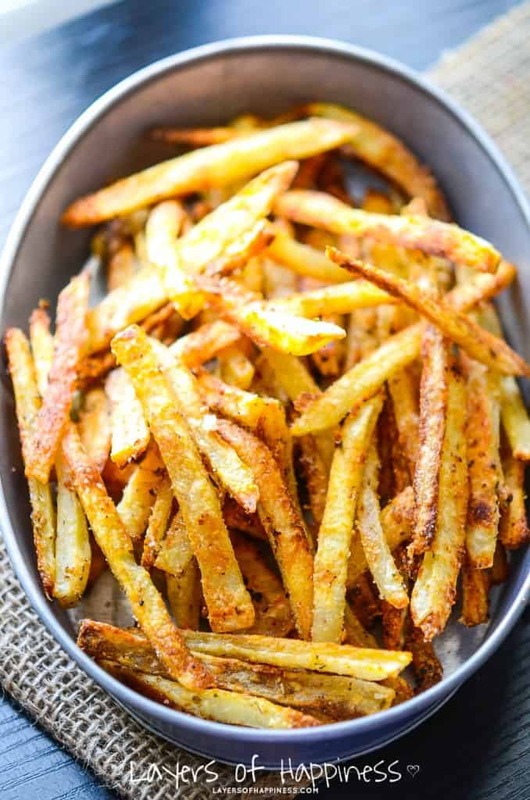 You can’t beat crispy oven baked “fries.” Definitely going to try it this weekend! I made these for my husband the other night. I over cooked them but they were still good! I LOVE the basil, so I added more! Next time, I will cook them for 30 mins on 400 because my gas oven heats up quickly. I have added it to my “Dinner rotation” Pinterest board. I make a side dish and a main dish once a week from that board. This is a side dish I will be making at least once a month, a staple in our home! Thanks for the great dish, Jen & Em! So glad i found this. Their in the oven as i type! Making fries has never made the house smell so good! This isnt just healthier but money saving. I go through oil SOOOOO fast and the fact that i only need a couple tablespoons is such a relief. I hate dumping oil. Planning on making this Saturday for Valentine’s Day 2015 with panned fried London Broil and veggie. Hubby loves French fries but he can’t have them anymore so this should be a nice treat. Thank you for the alternative!! Pingback: Recipe Round Up: March : Holy Hen House! These came out really good. As you stated, making sure the fries are as dry as possible after soaking and not crowding them on the baking sheet are crucial to getting them to crisp up. My favorite part was the seasoning mix, it was delicious on the fries. 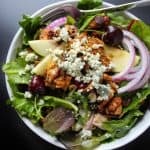 Pingback: How to Eat Healthy at: Chick-Fil-A | Noom Inc. Trying this today! Thanks for sharing. I like to crinkle the foil then spread it back out over the pan and spray with cooking spray. Crinkling the foil raises the fries off the pan and keeps them from burning and sticking. These were super yummy! I have made SO many baked fries in my time, but these were the best ever. Don’t know if it was the soaking part, or what, but they were nice & crisp, and tasted very good..
Just made these for our dinner tonight….Amazing! Great flavor and crispness! Loved them, thanks for the recipe! -You were right about spacing the fries: I used 3 medium potatoes and split them amongst 2 cookie sheets covered in foil with spray. The sheet with fewer fries crisped up quicker and overall were crispier than the one with more fries. -You are also spot on with the timing of the seasoning. I seasoned before (1 tbsp; 1 tbsp of oil); during (right after I flipped halfway thru); and after. The flavor was great. I could have used even more (I think it just depends on how much seasoning a person prefers). 1) On one of the sheets of fries, I sprinkled garlic salt (in addition to your salt mix) over them before putting into the oven. DELICIOUS. I’m a huge garlic fan, it gave them a little crunch, too. 2) I followed the oven temperature (400* at 30 minutes) for the first “roast,” then because I had to bake the cod at 450* for 20 minutes, just decided that the fries would be in there too, at 450*, for 20 more minutes. DELICIOUS. I never comment on recipes (usually because I don’t like using my email address) but I had to comment here. 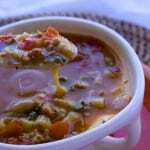 Excellent recipe: thank you so much for sharing! These look really delicious! I have one question. What happens between the first and second time of baking? Am I supposed to let the fries cool completely before baking them a second time? Thanks Ricky! The only thing that happens is an increase in the oven temperature. No cooling is necessary. The recipe looks great! Do you think I could bake them for the first 30 minutes at 400 and finish them at 425 the next day? Thanks Ashlan! I wouldn’t separate the baking rounds because it could dry the fries out. Hi! Can I skip the cumin? Is it ok without that? and if I only use 1 potato. How many salt I need? You can skip the cumin if you would like, I would say to keep everything else the same! Could I leave the skin on the potatoes? 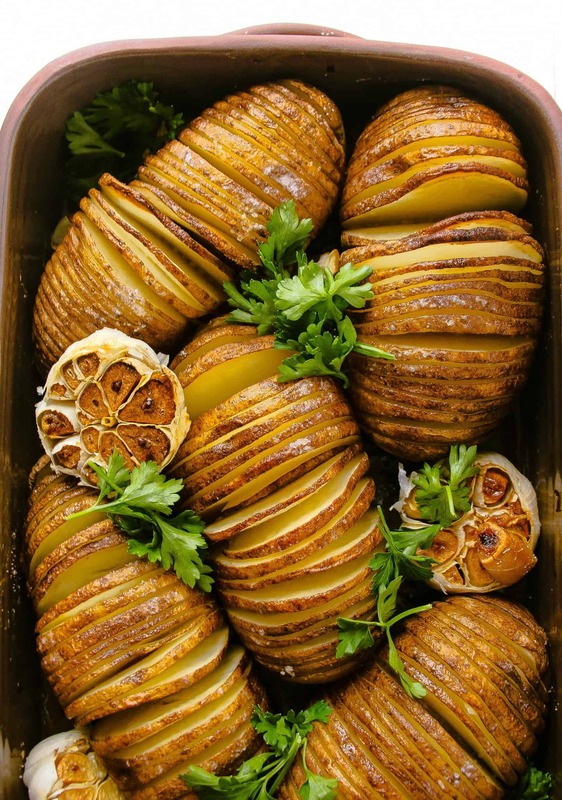 Has anyone tried with skin on the potatoes? Did they turn out as good? 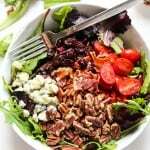 Just wanted to tell you that I have used this recipe for two years and have memorized it because I use it so often! It is amazing!!!! Most of the time we eat all of the fries before dinner, so we make another batch! Thanks for the recipe!!!!! I typically soak mine for at least 30 minutes but they can soak for as long as overnight! And yes I would soak sweet potatoes, but maybe not as long because they don’t tend to have as much starch! Going to try out this recipe tomorrow night! Quick question first, have you ever tried to make garlic fries with using this recipe? I was originally trying to find a recipe specifically for garlic fries but I came across yours first! Awesome! I haven’t tried garlic fries… but I am sure it will work.. just add some minced garlic in when you drizzle the olive oil on the fries! This was amazing I baked it for 20 minutes at 400 degrees Fahrenheit and baked it for about 10 minutes at 425 degrees Fahrenheit. This was so simple that I, a novice cook could make it. It was very crispy and all my family members thoroughly enjoyed it. I added some paprika, black ground pepper, salt, seasoned salt, and onion powder, and it was AMAZINGLY. Made these as my chips to go with my curry. Amazing!! I only used kosher salt though as the curry is the star here competing with an amazing fry 😉 Thanks for a great oven baked alternative to frying. These fries are delicious, but must agree the spice combo completes it! So yummy. Definitely worth the time and effort! So happy I clicked on your site. I was looking for timing for baking fresh french fries. These are amazing and by the way we are having a big blue cheese burger with them! Thanks for your recipes, I already know I will be back to make those beautiful oven roasted parmesan potatoes! Hi wonder if you can recommend any way to freeze these so you can just throw then in the oven when your ready for some fries?? I made them tonight! I used two potatoes & too much (1 & 1/2 tbs) of seasoning which was way to salty for me…I only baked them 30 mins. & they came out golden, crispy on the outside & chewy on the inside. They were good besides the salt. I will definitely make again & again! Thanks for sharing the recipe. These are amazing!!! I made them for dinner 4 nights ago and they were so delicious I’ve made them for lunch the last 3 days! They are perfectly crispy and the seasoning is such a great combo! I’ve always liked seasoned salt, but never would have thought to make some additions. Can’t wait to try some more of your recipes! Don’t usually comment but, Wow, made these tonight and it passed the teenager test. None left. I just used sea salt and the were very crispy and good.